In the summer of 2011 professor John Manning presented a revised version of his finger ratio theory. 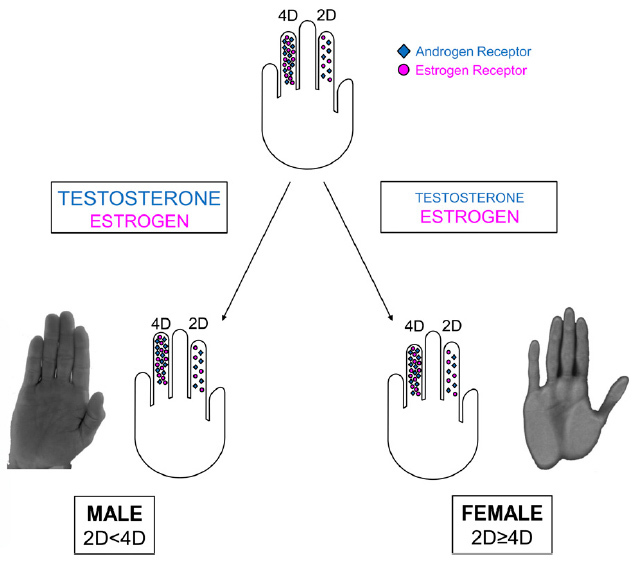 The new theory describes how the 2D:4D digit ratio should be understood as a biometric measure of the balance between prenatal testosterone- and estrogen estrogen concentrations. Manning's new working hypothesis is visually described in the picture above, which e.g. describes how the hormones especially become manifest in the length of the ring finger (while the index finger is less sensitive for the hormone balance). Refer your post and I am quite amazed by your video posed on determining the race results by Dr Manning .I have not read Dr Manning's study so could not comment much. But wonder if the study is no more than a mere generalization of 50:50 on either side. Re: 2011: John Manning revised his '2D:4D finger length' theory! ... But wonder if the study is no more than a mere generalization of 50:50 on either side. Sorry, I don't understand what you have in mind...? 7 - 2D:4D Finger ratio varies with ethnicity. What I have in mind is that while considering Dr Manning’s study of the hand we are generalizing the whole of humanity into two divisions. What hold’s for one does not for the other or the other has exactly different set of parameters set for previous . I remember the same set of discussion Mr Stalin in this forum had debated .I could recall some of it and could agree to some of his logic if not all. I have not read Dr. Manning’s book and can not comment much or carry on with the technalities. Although still a significant milestone that we could at least fix two variables within the study of hand reading with theories running wild. But are there any other sub variables within this 2D>4D or 4D>2D generalization to diversity the theory so that some more factors are at the palmist’s disposal while analysing the hands. Feel the same about Coburn’s and Unger’s methods of dividing personality types into some sub classes. These works are significant but are they really a tool for palmists or have the authors did not pass significant pieces of the puzzles. But I am sorry, I think you have made a few incorrect assumptions regarding Manning's theory, because Manning usually talks about 'correlates' - and not just 'two divisions' at all. Instead, he only uses the '2D>4D' (feminine ratios) and '2D<4D' (masculine ratios) categories in order to describe how '2D:4D ratio' typically manifests differently among the two sexes (which has been confirmed in nearly all studied populations around the world)... but he is actually talking about a measure that manifests through a continuous spectrum of ratios, usually between let's say 0.80 and 1.10. But for the perspective of digit ratios across various countries around the world, Manning also talks about three categories: 0.93 to 0.95 (= lowest 2D:4D ratios), 0.96 to 0.97 (= intermediate 2D:4D ratios), and 0.98 to 1.00 (= highest 2D:4D ratios). So, maybe you better stop thinking about fixed 'divisions' - because that is not what this theory is all about. Actually Ramann, since you explicitely described that you hardly read anything from Manning's work, I think your comment appears to suggest that your conclusions are based on a rather superficial study of Manning's illustrations only??? Regarding practical applications from Manning's theory, Manning described himself (quoted from the first video in my article): "It's difficult to make predictions to individuals." But in general, one should always be aware that 'predictions to indivuals' should never be done in absolute terms - because the digit ratio in an individual always (partly) depends on sexe, country and race. This implicates that in practical matters one should only compare the digit ratio in an individual with individuals from the same sexe, country and race, etc. Raman, so basically: Manning's theory is much more complex than the 'two divisions' that you started talking about. Does this make sense for you so far? Thanks for the detailed briefing of Dr Manning's study and the other variables concerned .Got exactly what I was looking for.